Since June of 2018, the self-proclaimed King Of All Media had been teasing his SiriusXM radio show listeners about a secret project. “For the last two years of my life, I’ve been involved in this project,” Howard said. 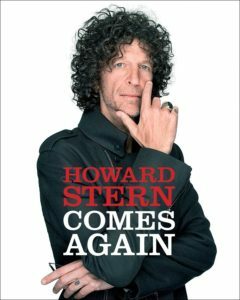 Apparently, Stern had been using his shortened radio schedule week (three days) and the bulk of his vacation time to complete his third book. Now, that project has finally been revealed: his new book, titled Howard Stern Comes Again! Stern’s third book will arrive at bookstores throughout the world this Spring, starting May 14, 2019. Within hours of his on-air announcement, the pre-sales made the book number one on Amazon’s best seller list. At this point, not much is known about the content of the book. The 560 pages will allegedly highlight both his growth over the years and his groundbreaking celebrity interviews from the Stern Show studio. He will also go into detail about his departure from terrestrial radio back in 2005. Stern’s previous two books were both New York Times best sellers. His first book, Private Parts, hit shelves in 1993 and later became a movie of the same name in 1997. “Miss America,” Stern’s second book, hit shelves in 1995. When will Howard Stern Comes Again be released? How long is Howard Stern’s new book? Who is publishing Howard Stern’s new book? Will Howard Stern’s new book be available on Kindle? Will Howard’s new book discuss Artie Lange? When is Howard Stern retiring? The book will be available for purchase everywhere starting May 14, 2019. However, you can pre-order the book at any time prior! The book, Howard Stern Comes Again, is currently 560 pages. This book is roughly a hundred more pages than his average for the past two books. His first book, Private Parts, was 448 pages in hardcover format. His second book, Miss America, is 482 pages. Simon & Schuster is publishing Howard Stern Comes Again. Simon & Schuster also published Stern’s first book, Private Parts. His second book was published by HarperCollins. Yes, the Kindle version of Howard Stern Comes Again will be available for $16.99. The book will likely also be available on other ebook devices. This is rumored to be true. In August of 2018, Artie Lange gave an interview to New Jersey 105.1 podcast in which he revealed that he was contacted by a book publisher informing him that Stern’s upcoming book mentioned him in a few spots. Lange left the show in December of 2009, when he showed up to work on the Stern Show after a whiskey/painkiller binge. During a commercial break, management told Artie to go home, and he was later granted time off from the show to enter into rehab. A few weeks later, he attempted suicide and never returned to the show. Howard has spoken very little about it over the years, despite Artie’s many run-ins with the law. No one but Howard (and maybe Beth) knows for sure. According to the New York Times, Howard’s current Stern Show deal with SirusXM runs until December 2020. It is unclear if he intends to retire then, or extend his contract further. He is currently 65 years old (January 12, 1954).